One of my guides is called Red Cloud and I know this for certain. Let me tell you how I know. During a meeting of the development circle in which I sit, I entered the trance state. Now whilst in trance most mediums, certainly myself, have little or no clear recollection of exactly what is taking place. The feeling is one of almost complete detachment, as if the body that you know as yourself belongs, albeit temporarily, to another spirit. That spirit uses the medium to speak to the other circle members. This is what the members of my circle told me happened. It seems that as we meditated together I began to drift into a semiconscious state, my breathing became deep and slow, gradually I drifted away and another took my place. A voice that was not my own spoke of things to come, of places and times that were beyond my understanding. The voice which spoke through me gave its name; “I am Red Cloud,” it said “and I lived a long, long time ago.” Red Cloud told my fellow circle members that in the near future I would receive proof that would confirm to me that my guide was an American Indian and that he was that spirit. On awakening from the trance I felt cold, though quite relaxed, as if I had been in a deep sleep within a rather chilly room. I had no knowledge of what the spirit had communicated and listened with great interest as I was told. How this Red Cloud intended to give me proof of his presence no one knew, least of all myself. It was some weeks later when I received the promised proof, I was attending at Saddleworth Spiritualist Church to take the service of communication. As I drove along the road approaching the town I heard a loud spirit voice inside my car. It was nothing else, the radio was off, the streets had little traffic and there was no one with me inside the vehicle. The voice said ‘RED CLOUD’ extremely loudly in a deep tone. I do hear voices from the spirit world but these are usually heard inside my head. This voice I heard with my physical ears. When I arrived at the Church I was offered a few tickets to buy for a fund raising raffle they were holding that evening. I bought a book of five tickets and went to look at the prizes, amongst the bottles of sherry, packets of biscuits and bowls of fruit was a large picture of an American Indian Chief. I wanted to win that picture. After the service the Church President drew the raffle. I didn’t win first prize but I did win the picture of the American Indian. Imagine my surprise when the lady who handed it to me said ‘Oh I see you won Red Cloud’. That was the name the guest medium from the previous week had given to this painting of an Indian Chief. Proof indeed, at least to me, that I had a guide who was able to identify himself and give me evidence of his existence. I have that very picture today over the fire-place in my home. It may not be an exact painting of my guide but, to me, it is absolute proof that in the next world I have an Indian guide whose name is indeed Red Cloud. Further research taught me that I am fortunate to be dealing with a great and powerful spirit guide that was once connected with a great medium of the 1950s, Estelle Roberts. I never call him just my guide, but I certainly count myself as under Red Cloud’s banner. He is powerful and he is strong and connected on high levels with a focus on world order – I consider myself in his service. Thank you so much – I am beginning to have an awareness of Red Cloud on the outskirts of my consciousness somewhere. It is like he is curious about my energy and interested in working through me perhaps. I am going to Mt Shasta and Wyoming in September and I am curious as to whether I will connect more strongly with Red Cloud and his mission while there. Grateful to hear of your experiences. 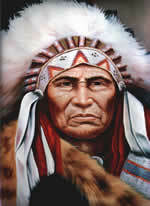 I have been told by something coming through an comunication divice my freind and I made that it’s name was chief Red Cloud and that he was my spirit guide! I was also told by my higher self that was being chaneled through a man that I was going to be a channel or trans medium. I was followed by a red cloud when I was a teenager and getting into trouble! My freind years latter saw a red cloud over my head! These are sigh a to me the he is my spirit guide and I wonder if he is the energy I will be channeling now that I’m ready to open up! I’m seeing a famous local phychic in a few days that told me I was ready! I’m very excited to here that other people have him as a guide!